Moving Objects on Mars? What is causing them to change location? This journal was originally posted to Bookofresearch.com, later posted to Facebook 1 , 2 and 3 (May 2012) for input and is now continuing and updated on this blog. These images were taken by Mars Spirit Rover. Following the order of Sol 1833, 1836 and 1843, Spirit would then move from right to left in this view and order. I took the small stone in the middle of the 3 on the left in this image as a reference point to determine the angle/direction. Notice the red circled object in the first image. Also notice that the green marked object in image 2 and 3 is not in image 1. From Sol 1833 navigation camera. The object in the red circle is gone. Note the green marked object which is not in image 1. From Sol 1836 navigation camera. Did the object from the red circle in image 1 move to the red circle in image 3? There’s a new object in the yellow circle where the one in the red circle previously was. Note the green marked object which was not in image 1 and in a different location as in image 2. From Sol 1843 navigation camera. Comment: there are more anomalies in these above pictures which i think are because of change of angle. The marked ones i have no explanation for. Note: I’ve send an email request to JPL on Monday May 28 2012, also to ask how far apart these images were taken, so far no reply yet. After initially making good progress on a new route around “Home Plate” to the east, Spirit has been struggling in local terrain on the northeast corner of Home Plate. The route is difficult because the direction is up-slope with a lot of loose, fine material denying the five-driving-wheel rover good traction.After getting about 15 meters (49 feet) away from Home Plate last week in just two drives, Spirit made only 1.4 meters of progress on Sol 1831 (Feb. 26, 2009). The next two drive sols accomplished only about 2 meters each. On Sol 1837 (March 4, 2009), Spirit had difficulty turning to face a new direction, again because of the soft terrain.The plan is to back downslope a little, turn and attack the uphill grade a little more cross-slope.As of Sol 1837 (March 4, 2009), Spirit’s solar array energy production is 282 watt-hours, atmospheric opacity (tau) is 0.742, and the dust factor on the solar array is 0.320. The rover is in good health as it attempts to make its way around the northeast corner of Home Plate. Spirit’s total odometry is 7,602.42 meters (4.72 miles). Spirit continued to struggle in local terrain on the northeast corner of “Home Plate.” Several drive attempts failed to make significant progress to the east up the modest slopes consisting of loose material.On Sol 1839 (March 6, 2009) a wheel diagnostic test was performed to make sure a wheel stall seen on an earlier sol was not an actuator problem. The actuator is fine.Drives on sols 1839, 1841 and 1843 (March 6, 8 and 10, 2009) all reinforced the futility of attempting further drives in this direction. Therefore, the project decided to head Spirit in the other direction, west around Home Plate. Spirit will begin to head that way in the sols ahead.As of Sol 1844 (March 11, 2009), Spirit’s solar array energy production is 281 watt-hours. Atmospheric opacity (tau) is 0.755. The dust factor on the solar array is 0.317, meaning that 31.7 percent of sunlight hitting the solar array penetrates the layer of accumulated dust on the array. The rover is in good health as it begins to head west around Home Plate.As of Sol 1843 (March 10, 2009), Spirit’s total odometry is 7,607.68 meters (4.73 miles). 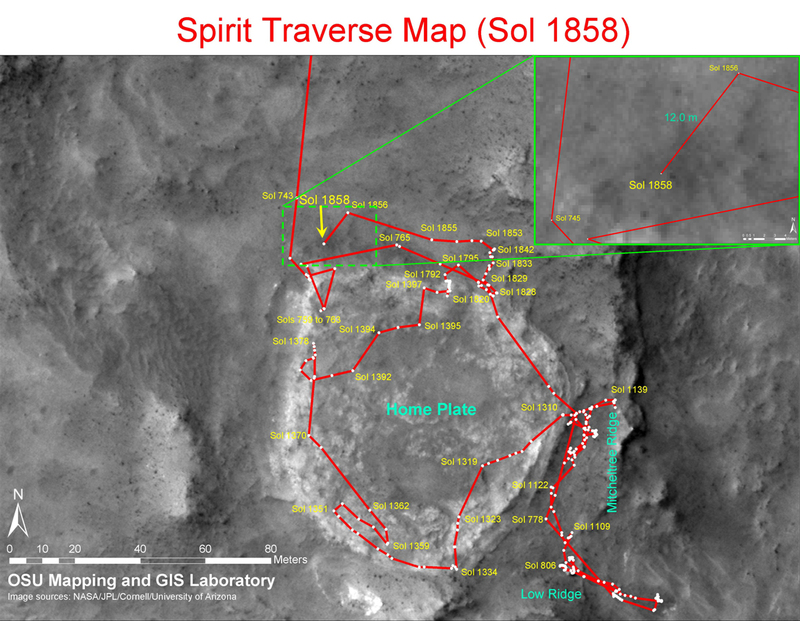 Although Spirit will now attempt the western route around the low plateau “Home Plate,” it must first safely move away from difficult terrain around the northeast corner of Home Plate. One tactical concern was a potato-size rock near the inside of the right rear wheel that posed a risk of getting stuck inside the wheel. Short maneuvers on Sol 1845 (March 12, 2009) and Sol 1847 (March 14, 2009) carefully moved the rover away from this hazard. On Sol 1850 (March 17, 2009), Spirit moved about 5 meters (16 feet), getting completely away from this trouble spot.Spirit also conducted some panoramic camera (Pancam) imaging and miniature thermal emission spectrometer (Mini-TES) spectral measurements of various science targets in the vicinity and performed an atmospheric argon measurement with the alpha particle X-ray spectrometer (APXS).Atmospheric conditions have worsened lately over the Gusev site, although no storm conditions have been reported.As of Sol 1851 (March 18, 2009), Spirit’s solar array energy production has decreased to 230 watt-hours, down 18 percent from a week earlier. Atmospheric opacity (tau) has increased sharply, to 1.19. The dust factor on the solar array is 0.313, meaning that 31.7 percent of sunlight hitting the solar array penetrates the layer of accumulated dust on the array. The rover is in good health in spite of dustier skies.As of Sol 1850 (March 17, 2009), Spirit’s total odometry is 7,612.49 meters (4.73 miles). 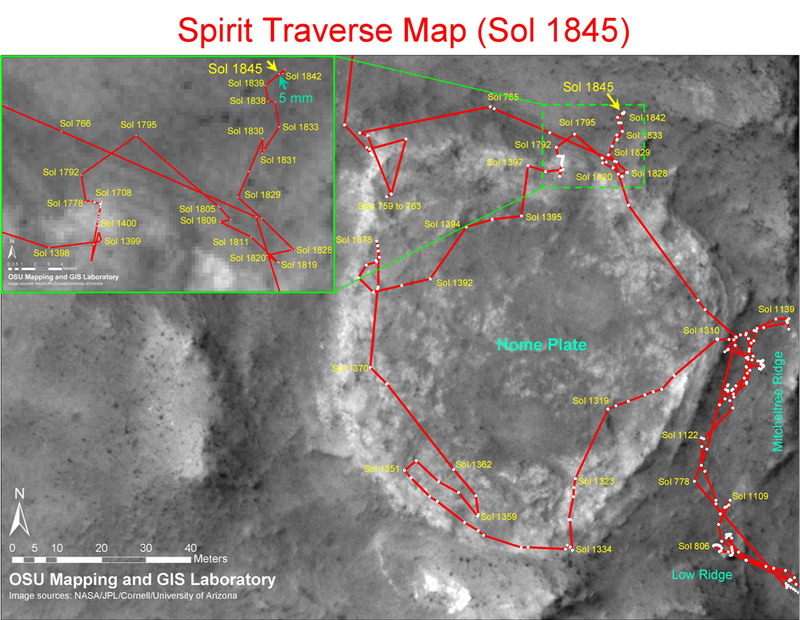 sol 1852-1858, March 19-25, 2009: Distance Record for Five-Wheel DrivingSpirit is making good progress around Home Plate to the west. After getting clear of troublesome rocks, Spirit drove 13.8 meters (45.3 feet) on Sol 1854 (March 21, 2009). The next drive, on Sol 1856 (March 23, 2009), achieved a new distance record for five-wheel driving. Spirit drove 25.82 meters (84.7 feet), beating the old record by about a meter. Spirit completed another drive of 12.9 meters (42.3 feet) on Sol 1858 (March 25, 2009). The sol ahead will see the building of the new R9.3 flight software on board the rover. The rover will boot the new software on the subsequent sol. As of Sol 1858 (March 25, 2009), Spirit’s solar array energy production is 233 watt-hours. Atmospheric opacity (tau) remains elevated at 1.15. The dust factor on the solar array, 0.309, means that 30.9 percent of sunlight hitting the solar array penetrates the layer of accumulated dust on the array. The rover is in good health in spite of dusty skies. 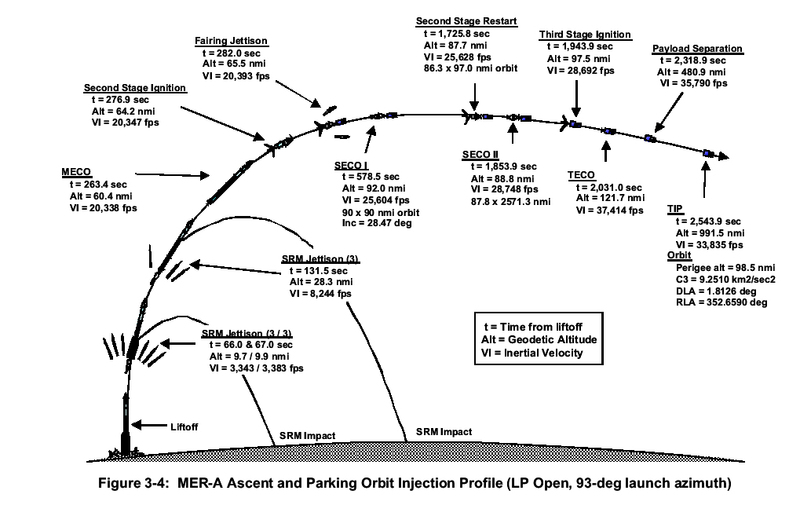 Spirit’s total odometry is 7,665.02 meters (4.76 miles). * Atmospheric conditions have worsened over the Gusev site, although no storm conditions have been reported. Could the same theory apply to the moving rocks on Mars? Sailing stones, sliding rocks, and moving rocks all refer to a geological phenomenon where rocks move and inscribe long tracks along a smooth valley floor without human or animal intervention. The Death Valley stones move only every two or three years and most tracks develop over three or four years. Stones with rough bottoms leave straight striated tracks while those with smooth bottoms tend to wander. Stones sometimes turn over, exposing another edge to the ground and leaving a different track in the stone’s wake. Trails differ in both direction and length. Rocks that start next to each other may travel parallel for a time, before one abruptly changes direction to the left, right, or even back to the direction from which it came. Trail length also varies – two similarly sized and shaped rocks may travel uniformly, then one could move ahead or stop in its track. Tracks of sliding rocks have been observed and studied in various locations, including Little Bonnie Claire Playa in Nevada, and most notably Racetrack Playa, Death Valley National Park, California, where the number and length of tracks are notable. At Racetrack Playa, these tracks have been studied since the early 1900s, yet the origins of stone movement were not confirmed and remained the subject of research for which several hypotheses existed. However, as of August 2014, timelapse video footage of rocks moving has been published, showing the rocks moving at low wind speeds within the flow of thin, melting sheets of ice. The scientists have thus identified the cause of the moving stones to be ice shove. Based on a study released in August 2014, news articles reported the mystery solved when researchers observed rock movements using GPS and time-lapse photography. They witnessed and documented a rock movement on December 20, 2013 that involved more than 60 rocks, with some rocks moving up to 224 meters between December 2013 and January 2014 in multiple move events. This study contradicted earlier hypotheses of winds or thick ice floating rocks off the surface. Instead, rocks move when large ice sheets just a few millimeters thick start to melt during periods of light wind. These thin floating ice panels push rocks up to five meters per minute. Scripps paleo-oceanographer Richard Norris describes the mystery of sliding rocks in Death Valley. How Do Death Valley’s “Sailing Stones” Move Themselves Across the Desert? Could the same theory that solved the mystery of the sliding rocks of Death Valley explain the moving stones at Mars “Homeplate” Gusev crater on 10 March 2009? There is clearly a trail visible. So the next thing to find out is, could there have been a small stream of water flowing or thin floating ice panels pushing the rocks up? This could explain the movements of the rocks on the trail path and leaving the other stones unmoved. Mars Anomalies: indicaton of water stream on Sol 1843 taken on March 10 2009 at Gusev Crater on the northeast corner of the “Home Plate” possible cause for the stones to move? NASA’s Mars Exploration Rover Spirit used its navigation camera to take the images that have been combined into this stereo, full-circle view of the rover’s surroundings during the 1,843rd Martian day, or sol, of Spirit’s surface mission (March 10, 2009). South is in the middle. North is at both ends. This view combines images from the left-eye and right-eye sides of the navigation camera. It appears three-dimensional when viewed through red-blue glasses with the red lens on the left. The Sol 1854 drive, following two others in the preceding four sols that also achieved little progress in the soft ground, prompted the rover team to switch to a plan of getting around Home Plate counterclockwise, instead of clockwise. The drive direction in subsequent sols was westward past the northern edge of Home Plate. This view is presented as a cylindrical-perspective projection with geometric seam correction. Vast deposits of water appear to be trapped within the ice caps at the north and south poles of the planet Mars. Each summer, as temperatures increase, the caps shrink slightly as their contents skip straight from solid to gas form, but in the winter, cooler temperatures cause them to grow to latitudes as low as 45 degrees, or halfway to the equator. The caps are an average of 2 miles (3 kilometers) thick and, if completely melted, could cover the Martian surface with about 18 feet (5.6 meters) of water. Scientists say more water may be frozen just beneath the surface, covered by the dry red dust that blankets the planet. Some high-latitude regions seem to boast patterned ground-shapes that may have formed as permafrost in the soil freezes and thaws over time. The European Space Agency’s Mars Express spacecraft captured images of sheets of ice in the cooler, shadowed bottoms of craters. These images from the Phoenix Mars Lander show sublimation of ice in the trench informally called “Dodo-Goldilocks” between Sols 20 and 24 (June 15 and 18, 2008. The following animation simulates a fly-around look at one of the places on Mars where dark streaks advance down slopes during warm seasons, possibly involving liquid water. This site is within Hale Crater. The streaks are roughly the length of a football field. Time on Mars is easily divided into days based on its rotation rate and years based on its orbit. Sols, or Martian solar days, are only 39 minutes and 35 seconds longer than Earth days, and there are 668 sols (684 Earth days) in a Martian year. For convenience, sols are divided into a 24-hour clock. Each landed Mars mission keeps track of “Local Solar Time,” or LST, at its landing site, because Local Solar Time relates directly to the position of the Sun in the sky and thus the angle from which camera views are illuminated. The time of day, Local Solar Time, depends upon the lander’s longitude on Mars. Unlike on Earth, there is no leisurely-orbiting moon to give Mars “months,” and while there have been many imaginative calendars suggested for Mars, none is in common use. The way that scientists mark the time of Mars year is to use solar longitude, abbreviated Ls (read “ell sub ess”). Ls is 0° at the vernal equinox (beginning of northern spring), 90° at summer solstice, 180° at autumnal equinox, and 270° at winter solstice. On Earth, spring, summer, autumn, and winter are all similar in length, because Earth’s orbit is nearly circular, so it moves at nearly constant speed around the Sun. By contrast, Mars’ elliptical orbit makes its distance from the Sun change with time, and also makes it speed up and slow down in its orbit. Mars is at aphelion (its greatest distance from the Sun, 249 million kilometers, where it moves most slowly) at Ls = 70°, near the northern summer solstice, and at perihelion (least distance from the Sun, 207 million kilometers, where it moves fastest) at Ls = 250°, near the southern summer solstice. The Mars dust storm season begins just after perihelion at around Ls = 260°. The coincidence of aphelion with northern summer solstice means that the climate in the northern hemisphere is more temperate than in the southern hemisphere. In the south, summers are hot and quick, winters long and cold. An approximate true-color view of Adirondack rock, taken by Spirit’s pancam. Gusev crater lies at the outlet of one of the largest valley networks on Mars, Ma’adim Vallis (deriving its name from the Arabic name for the Red Planet). The valley is about 900 km in length. The rocks we are looking at in the area of interest seem to be Adirondack rocks, as shown in the picture left. (Except for the moving rock, we’ll get into that later). The microscopic images that Spirit has returned indicate that Adirondack is a hard, crystalline rock. The large and small peaks in Adirondack’s electromagnetic spectrum reveal that the minerals in the rock include olivine, pyroxene and magnetite – which is a common composition in volcanic basalt rocks on Earth. The dust in Gusev Crater is the same as dust all around the planet. All the dust was found to be magnetic. Moreover, Spirit found the magnetism was caused by the mineral magnetite, especially magnetite that contained the element titanium. One magnet was able to completely divert all dust hence all Martian dust is thought to be magnetic. The spectra of the dust was similar to spectra of bright, low thermal inertia regions like Tharsis and Arabia that have been detected by orbiting satellites. A thin layer of dust, maybe less than one millimeter thick covers all surfaces. Something in it contains a small amount of chemically bound water. The drive direction in subsequent sols was westward past the northern edge of Gusev crater’s “Home Plate”. There is ice found at the Gusev Crater “Home Plate” region at Mars which when temperatures are above minus 10 degrees Fahrenheit (minus 23 Celsius) becomes liquid water. There appears to be seasonal ebb and flow at the Gusev Crater “Home Plate” region at Mars. Spirit was about to get ready for a Martian wintertime. The dust in Gusev Crater is the same as dust all around the planet. All the dust was found to be magnetic. More information about the rovers is at http://marsrovers.jpl.nasa.gov/home/index.html. Dust reports from the Thermal Emission Imaging System, operated by Arizona State University, Tempe, are at http://themis.asu.edu/dust_maps/. Weather reports from the Mars Color Imager team are at http://www.msss.com/msss_images/latest_weather.html.